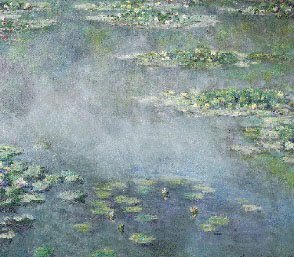 There was an auction at Christie’s in London on June 23 and one of the pieces under the hammer was a Monet Nympheas from the Andrew Lloyd Webber foundation. This painting failed to sell, opening at 22 Million pounds. The estimate was 30 to 40 Million pounds. This may seem like a lot of money to us plain folk, but in May, a Picasso went for 106.5 Million Euros. “The second picture on which the auction house staked high hopes was one of the 30 or so views of water lilies (“Nymphéas”) painted by Monet. The finest among these rank among the great masterpieces of 20th-century Western painting. Unfortunately, Christie’s picture suffered from a white haze, awkwardly spreading in the middle area, which made one wonder whether this was intentional or whether it reflected the fact that the painter had left his picture partly unfinished”. Hello? What are they teaching in art school these days? It’s Impressionism! It’s MONET! Let's consider a cloud, fog, or dare I say it, yes, HAZE! If the above opinion is correct, we’re all in big trouble. What could be worse than getting ripped off with a blurry Monet? If I spend 30 M pounds, I want to be sure the painting is finished! What was Monet thinking? Didn’t he have the cash for bread and milk? Was Mrs. Monet after him to get this junk out of the house? He signed it after all so he was ready to sell. If I had 30 M pounds kicking around, I'd be proud to hang this painting on my wall. You do expect more from the NY Times!